A celebration of the nuttiness and obsessives in all of us, RecordSetter is the new world record- setting phenomenon, a website that believes everyone can be the world's best at something--and where 80,000 people a month come to prove it, or just enjoy watching. Corey Henderson and Dan Rollman, the creators of RecordSetter, are two entrepreneurs obsessed by world records who appear regularly on "Late Night with Jimmy Fallon" and host events in cities around the country. 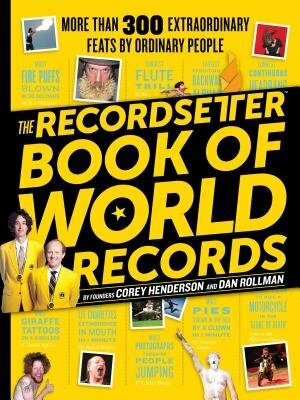 "The RecordSetter Book of World Records" captures all the exuberance, energy, and quirky good humor of the records and record-setters. Here are more than 300 of the longest, loudest, slowest, weirdest, coolest, and most-difficult-to-break world records. There are Food & Drink Records. Sports & Games Records. Records set by (not-so) average Joes, and records set by celebrities ("Most Bunnies Snuggled in a Hammock "by Cameron Diaz).